Please note: Arie has left the "Economics" group at Duke University; some info here might not be up to date. 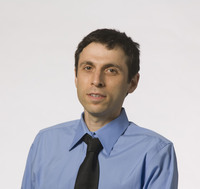 Arie Beresteanu became an assistant professor at Duke University in 2001. He has also been an Instructor at Hebrew University, and has taught microeconomics, econometrics, and industrial organization. He also serves as a senior thesis advisor. Arie earned his Ph.D. in economics from Northwestern University in 2001, and his M.A. and B.S. from Hebrew University in Jerusalem, Israel. Arie’s fields of interest include econometrics and empirical industrial organization. His research focuses on non- and semi-parametric econometrics, partially identified models, estimation of games, and estimation of dynamic/structural models in IO. He has published his work in the RAND Journal of Economics and in Econometrica. These works explored the “nonparametric analysis of cost complementarities in the telecommunication industry” and on the “asymptotic properties for a class of partially identified models.” He is currently working in collaboration on various projects, the topics of which include minimum-wage laws; income tax; retail oligopoly; incomplete econometric models; and others. He is currently working to renew his grant from the National Science Foundation for his research on “Asymptotic Properties for partially Identified Models.” In 2009, Arie presented his ideas and research at UBC, UT Austin, Georgetown, and Vanderbilt University, and is scheduled to visit SUNY Stony Brook in the fall of 2009. In the past, he has presented across the country and around the world at places such as the Hebrew University, the European Economic Association, Harvard, Cornell, the Department of Economics, and many more. Arie has received several awards for his work, including the Arnold Zellner Award for the Best Ph.D. in Business and Economic Statistics in 2002, and the Young Economist Award of the European Economic Association in the same year. Arie has played a large role within the Duke economics department outside of teaching. For 2005-2008, he was co-organizer of the applied industrial economics seminar, and from 2007-2008, he was co-organizer of the economics seminar. In past years, he has also served as dissertation supervisor for several committees, and also as a member of econometrics field exam committees. He has refereed papers for several academic journals, including the Journal of Applied Econometrics and the RAND Journal of Economics. Outside of his academic work, Arie has also had experience working as an economist in the foreign exchange department at the Bank of Israel in Jerusalem. Arie is a citizen of both the USA and Israel. He lives with his wife and three children. Arie Beresteanu specializes in econometrics and empirical industrial organization. His research utilizes partially identified models and estimation of dynamic//structural models in IO in pursuit of the estimation of games and the exploration of non- and semi- parametric econometrics. He received a grant from the National Science Foundation for his research during 2006-2009, which he plans to renew for his collaborative project with Francesca Molinari on “Asymptotic Properties for Partially Identified Models.” He has collaborated with his contemporaries on projects in the past, including his work on “Sharp Identification Regions in Games,” on which he also worked with Molinari and with Ilya Molchanov as well. He is currently conducting several projects, including “Dynamic Competition in Oligopolistic Markets” with Paul Ellickson, “Testing a Nonparametric Null Hypothesis against a Nonparametric Alternative” with Adam Rosen, and “Set Identification in Contingent Valuation Surveys with Application to Drought Mitigation in Indonesia” with Chris Timmins and Subhrendu Pattanayak. Proud husband of Galit Beresteanu and a proud father of Guy, Liam and Maya.